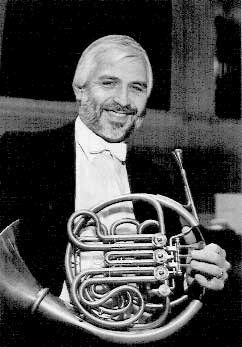 Dale Clevenger has been principal horn of the Chicago Symphony Orchestra since 1966, a soloist with orchestras worldwide, a participant in festivals and symposiums, and a conductor. He received an honorary doctor of music degree from Elmhurst College in 1985 and teaches at Roosevelt University. Clevenger is a graduate of Carnegie-Mellon University, Pittsburgh. His mentors are Arnold Jacobs and Adolph Herseth. Before joining the Chicago Symphony, Clevenger was a member of the American Symphony Orchestra and the Symphony of the Air, and principal horn with the Kansas City Philharmonic. While in New York City, he recorded commercial jingles. His recordings include antiphonal music with the brass sections of Chicago, Philadelphia, and Cleveland, Mozart Horn Concertos, Joseph and Michael Haydn Concertos, Schumann Konzertstück, Britten Serenade, and Strauss Concerto No.1. He premiered John Williams' Concerto for Horn and Orchestra in 1993. His conducting career has included guest appearances with the New Japan Philharmonic, the Louisiana Philharmonic, the Shanghai Symphony Orchestra, the Florida Symphony, the Civic Orchestra Chicago, the Western Australia Symphony Orchestra (Perth), the Aguascaliente Symphony Orchestra (Mexico), and the Osaka Philharmonic Orchestra. Clevenger has published a series of method books, The Dale Clevenger French Horn Methods, with the Neil A Kios Music Company. Clevenger has served on the IHS Advisory Council (1974–1981), received the Punto Award in 2009, and became an Honorary Member at the 2010 IHS Symposium in Brisbane, Australia.